Is the Terrace too crowded? Need a break from all the chatter? The Allen Centennial Garden is a prime spot for a study session before the snow flies. While it may not be ideal for homework on the computer, you can easily plop down on a bench in the middle of the garden and read that novel for lit class you’ve been neglecting, or finish up a few short readings. 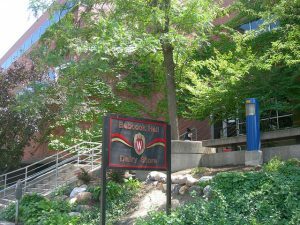 If you need a quick study break, simply walk down to Lakeshore Path and enjoy the view of Lake Mendota, or pop on over to Babcock Hall Dairy Store for a quick sandwich. Don’t forget the ice cream of course! When winter is on it’s way and you can’t go to the garden anymore, you can still get a slice of nature by strolling up Observatory Drive to the Social Science building. Although the building is quite confusing, just look for the signs towards for the Social Sciences library on the 8th floor. Once you get to the library, there is a room directly to the left of it that has several windows offering an expansive view of Lake Mendota. There is typically only a handful of people there, making it a great alternative to the busy study spots with lake-facing windows such as the popular College Library.